I don’t know if it’s because the recession has levelled the playing field – by weakening the big four – but already this season feels very different. By different, I mean unpredictable. And about time too. For years we have waited for a genuinely unpredictable Premier League, sitting through countless dreary games where the result was never in question (why do you think Mark Lawrenson ALWAYS predicts a 2-0 home win for Chelsea? ), despite Sky Sports’ vainglorious attempts to convince us otherwise. Now it looks like this could be the season in which the goalposts move. 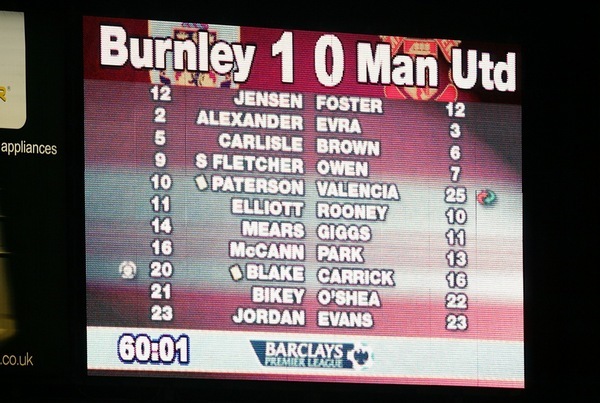 Man Yoo were absolutely terrible in losing at Burnley, prompting every football writer in the world to conclude that yes, United are a bit underpants without a certain C-Ron to pull the rabbit from the hat. They weren’t much better in beating Birmingham at Old Trafford. Arsenal now look like world beaters. Against the odds, so do Arry’s Spurs. Top of the league? Marvellous. Liverpool fans have gone from deep despair to the double delight of a thumping home win and a laughable United defeat. Chelsea could be anything. Everton and Aston Villa failed to do good business in the summer and the negative effects are clear. Man City are the big unknown. They could win the league. It would be the biggest shock in the history of the English top flight, but, you know, they could. Of course, it’s ridiculously kneejerky to assume too much from a handful of games, but I’m optimistic that we’re in for a vintage season (still not a draw in sight! ), from top to bottom. Without optimism, the football fan is nothing. I love this season already. Let’s all pray it doesn’t settle back into the old routine. I’m still confident that Liverpool will win the League!!! Such a great unpredictable start. I’m in amazement that there still has yet to be a single draw!